Three great artists are getting together to release another book of Japanese ultra-erotica. 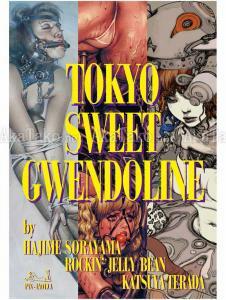 "Tokyo Sweet Gwendoline" is the follow up to Hajime Sorayama, Rockin' Jelly Bean, and Katsuya Terada's very popular "Pussycat! Kill! Kill! Kill!". Both books are going to be SIGNED by all three artists! T-shirt quanitities are EXTREMELY limited. Tokyo Sweet Gwendoline TSG Exhibition t-shirt Pussycat! Kill! Kill! Kill! Just added for pre-order, all three items will arrive to AkaTako mid to late September 2018. Click images or titles above to order.